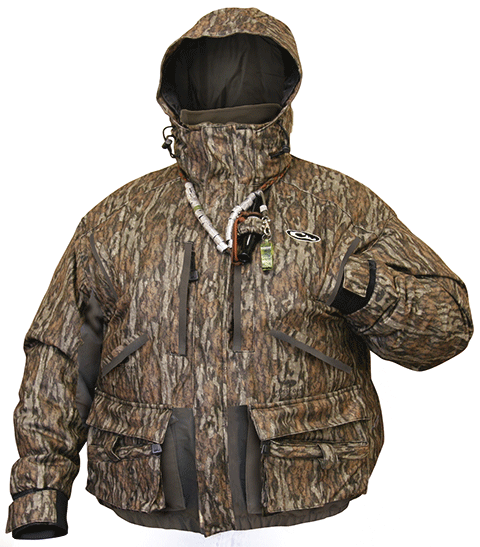 The Drake LST Waterfowler’s Insulated Jacket 2.0 is a workhorse when it comes to cold-weather hunting. When Drake set out to design a one-piece, all-in-one hunting coat, they made sure it would raise the bar in waterfowl clothing. This jacket is packed with Instinctive Features pioneered by Drake Waterfowl and upgraded with the little details that make a big difference in performance. The LST Waterfowler’s Insulated Coat is designed with reinforced poly-denier fabric in high-wear and high-stress areas. One example is the lower back area, reinforced to protect the life of the coat when leaning against a tree, or coming into constant contact with the side of a boat, the back of a blind, or the wall of a pit blind. The pocket openings, support panels for the Spring-Open™ Shell Pockets, and the sides of the torso have all been reinforced to stand up to the abuse that all waterfowl hunters face day in and day out. Instinctive Features: - Deep Water Hand-Warmer Pockets™ with reverse entry to block out the wind when you aren’t using the pockets - Vertical Magnattach™ Call Pocket on left chest - Vertical License/Key Pocket with zippered security closure on right chest - Angled hand pockets with reverse entry to block out moisture - Spring-Open™ Shell Pockets with removable spring mechanism - Zippered storage pockets behind the Spring-Open Shell Pockets - Inverted pleats on back of shoulders for extended range of motion and high overhead shots - Three-piece adjustable hood – zips off for times when the hood is not needed - Rear zippered cargo pocket on the lower back of the coat – perfect for storing extra gloves, a dog leash, the hood of the jacket when it is removed, and other small accessories - Two small internal chest pockets - Neoprene cuffs Materials: Refuge HS™ shell fabric, 220 gram insulation, 100% Waterproof/Windproof/Breathable Hypershield 2.0 Technology, easy on/off taffetta lining.